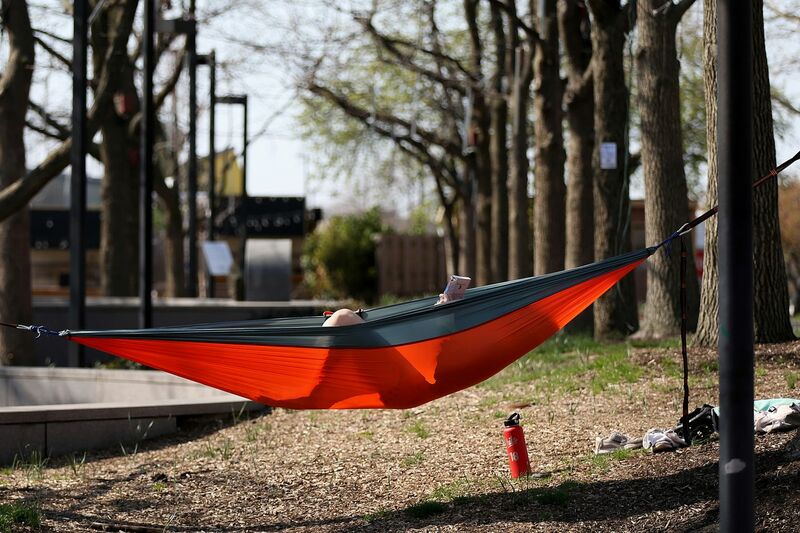 Emily Shields lies in her hammock while reading "Star Wars: Heir to the Empire" at Spruce Street Harbor Park last spring. It’s the first day of season, which means those days of extra layers, hats, and gloves will soon be swapped out for pick-up games and picnics in Rittenhouse Square. While you won’t want to put the coat away quite yet, warmer temperatures and longer days are on the horizon. Here’s why we recognize today as the official start of spring, the forecast, and when to spot that special supermoon you’ve been hearing so much about. The astronomical start of spring, or the vernal or spring equinox, arrives Wednesday at 5:58 p.m., according to the National Weather Service. The meteorological start of spring, however, began March 1 and is based on “annual temperature cycles and the Gregorian calendar,” according to AccuWeather. The spring equinox is the one of just two times per year when "the Earth’s axis is tilted neither toward nor away from the sun, resulting in a ‘nearly’ equal amount of daylight and darkness at all latitudes” — about 12 hours and 12 hours — according to the weather service. The other instance, of course, is the autumnal equinox, or the start of fall that will come Sept. 23. The spring equinox means that the days will continue to get longer as the sun rises higher in the sky, eventually bringing the summer solstice on June 21. Why hasn’t spring always started on the same day? Infographic showing the astrological start of the seasons. What’s the deal with this ‘supermoon’ — or the ‘super worm moon’? Clear weather provided, Wednesday will not only bring the start of spring, but the third and last “supermoon” of the year in an “astronomical doubleheader,” according to USA Today. The supermoon — when the moon will appear larger and brighter than usual, will arrive at 9:43 p.m. Wednesday, marking the “closest coincidence” of a full moon happening on the start of spring since 2000, according to the astronomical website EarthSky.org. The next time this will happen will be in 2030 — and Bryce Harper will still be playing for the Phillies. As for the “worm” nickname? That’s just because this moon happens when “the ground begins to soften and earthworm casts reappear, inviting the return of robins," according to The Old Farmer’s Almanac. While Wednesday’s high won’t be anywhere close to the 70-degree weather that served as a bit of a tease last week, it looks like the area is moving away from arctic temps. Wednesday will be mostly sunny with a high in mid-50s before dipping down to around 40 degrees overnight, when there will be a chance of rain. There’s more rain likely Thursday, when the high will reach the low 50s, according to the National Weather Service. How is Philly celebrating the start of spring? Spring and Rita’s Italian Water Ice have a symbiotic relationship in the Philadelphia region. Rita’s and Dairy Queen are giving away frozen treats while Ben & Jerry’s and Haagen-Dazs will hold similar events later in the season. Spring is also the season for cleaning. Philly’s 12th-annual spring cleanup will happen on April 6, and is called the “largest citywide cleanup of the year.” Got an official cleanup project? Register it with the city by Friday in order for it to make it on the official Philly Spring Cleanup website. >>READ MORE: Should you hire your own Marie Kondo to organize your home? Of course, there’s plenty more to look forward to this spring. Sports fans need no reminder that they’ll be able to witness Bryce Harper’s first season with the Phillies, while the Inquirer’s Spring Arts Guide is worth checking out if you’re trying to pencil in all the upcoming concerts, movies, festivals, and more happening in the area.